Texas Gov. 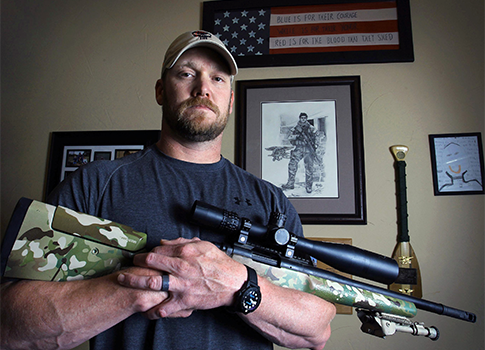 Greg Abbott awarded former Navy SEAL Chris Kyle the highest military decoration the state can give, the Texas Legislative Medal of Honor, on Wednesday. Kyle, who served in Iraq, was the subject of the 2014 Academy Award-nominated film American Sniper based on his book of the same title. The award will be given to Kyle posthumously, as the former Navy SEAL was shot and killed by another veteran who was battling post-traumatic stress disorder. Abbott also awarded the medal posthumously to Lt. Col. Ed Dyess, the former World War II pilot and prisoner of war for whom the Dyess Air Force Base located just outside of Abilene, Texas, is named. "America is the brightest beacon of freedom the world has ever known because of all who have honorably worn the uniform of the mightiest military in the history of the world," Abbott said Wednesday in Austin. "For their remarkable valor and selfless service, it is my distinct honor to present the Texas Legislative Medal of Honor to Lt. Col. Ed Dyess and Chief Petty Officer Chris Kyle. We can never repay the debt we owe for the lives these men saved and the freedom they preserved, but today we honor their memory, their patriotism and their sacrifice," Abbott continued. Abbott presented the medals to Chris Kyle’s wife Taya and to the family of Ed Dyess. This entry was posted in National Security and tagged American Sniper, Chris Kyle, Military, Texas. Bookmark the permalink.